The George Campbell Taylor (1835-1907) estate built c. 1885 in East Islip. Below, the house c. 1924 after alterations. Photos and the following write up from author Ray Spinzia: George Campbell Taylor was the son of the wealthy merchant and banker Moses Taylor from whom George inherited the income from $20 million. After acquiring the Plumb estate, George and his common-law-wife/housekeeper Betsy Head alternately stayed at the Plumb and Taylor mansions. They became despondent and turned to alcohol when Betsy’s eighteen-year-old daughter Lena married their gardener. 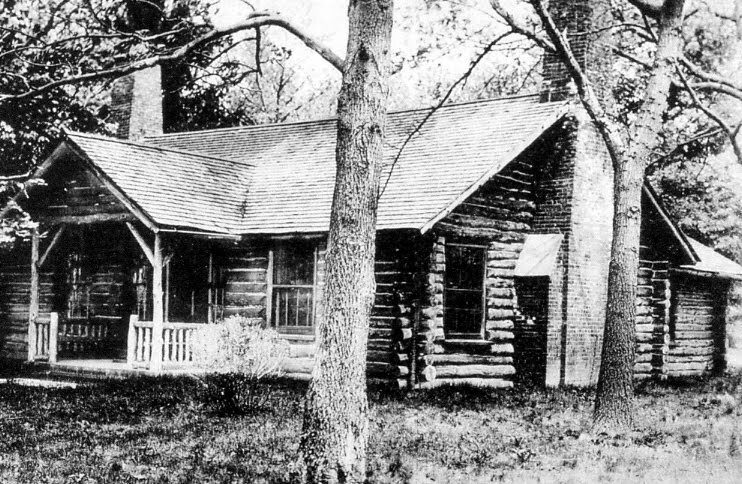 Local lore has it that Taylor’s alcoholism became so acute that he was unable to climb the stairs to his second-floor bedroom and resorted to drinking himself into a stupor in a log cabin on the estate (seen below). George and Betsy died in 1907 within three months of each other but not before disinheriting Lena, whose husband went on to be the foreman at William Kissam Vanderbilt, Jr.’s Lake Success estate 'Deepdale'. I like the exterior better before the 1924 alterations although I suspect there was good reason for enclosing the balcony & part of the porch (possibly to protect interior rooms from winter weather). I like the log cabin better than either version of the house. I wonder if that’s Betsy Head pushing Lena in a baby carriage in the first picture. Perhaps Lena had a happy marriage & for her a happy life was worth the loss of a big inheritance. I seriously doubt Lena’s marriage to the gardener is what drove George Campbell Taylor & Betsy Head to alcoholism – usually alcoholism drives someone to alcoholism & blaming someone else’s actions is something an alcoholic does (my life’s experience). My guess is that screens of the era were not the most efficient filter for the notorious South Shore mosquito. To this day they spray and spray and spray. The addition might well have been an attempt to keep the mosquitoes at bay. Since these were summer homes, they were probably blissfully unaware of the heating inefficiencies of the house although toward the end of his life Taylor did live there year round. 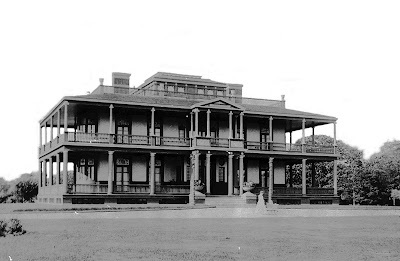 The alterations were made after Taylor's death by the Taylor/Pyne family corporation, it is doubtful that the corporation's family members used it as year-round residence. To my knowledge, only Taylor and, to a lesser extent, Bourne, who had an estate in the 1000 Islands, were year-round South Shore estate residents. Most South Shore and East End people had closed up their summer homes by hurricane season. A comment credited to one of the Shore Shore matrons in reference to the spraying encouraged the cessation of spraying to keep the city people from visiting the area. Ray, thank you for your insight. When I look at a house or changes to a house I try to figure out, “What were they thinking?” Of course your explanation makes more sense than my guess. D, love it!! I must find a way to use that sign story; it's a gem. Thanks. Up here, many big old summer houses originally built with open porches found those porches soon semi or fully glassed in, as sleeping porches upstairs, and to shelter from ocean breezes downstairs. Interesting what different paths the Taylor children took: George Taylor's brother H.A.C. Taylor's Newport House was one of McKim Mead & White's masterpieces. His sister's children, the Pynes went on to become absolute fixtures in Society (and also major architectural patrons---Glen Farm, the Moses Taylor Pyne house outside Newport is one of John Russell Pope's best houses. Very different fate than their cousin married to the Idle Hour superintendent. Another of George Taylor's sisters was the mother of Bronson, Grenville and Robert Winthrop, Delano & Aldrich clients all, if I remember correctly. His mother's obituary in the New York Times refers to George Campbell Taylor as unmarried and having become "somewhat conspicuous a few years ago by buildng a remarkable house near Islip, the grounds of which are laid out in a fanciful manner and include a zoological garden with a number of wild animals in cages". Here ––– I'll do it for you (careful folks; the NY Times has a new pricing structure that only allows for 20 free links per month ––– unless you're using an iPad). They tried to find some way around Apple's 30% cut. I recall first seeing this pair of photos and, even understanding the environmental reasons to make such changes I still could not comprehend how a most likely uninsulated/unheated summer bungalow could have been so unfortunately tarted up as it was. Security word - rophea: a skin condition related to impetigo that resembles an "Indian burn." I would have chosen the mosquito's. The first incarnation of this home is far superior...what magnificant outer porches!!! So Betsy Head hereslf was a housekeeper and "living in sin" yet she was crushingly disappointed by her daugter's marrying a lowly gardener? Nice. I'll jump on the bandwagon here and agree that the house looked much better before those alterations took place. This posting, along with the previous one, were very much appreciated. As a 10th generation Hudson Valley resident, I've always been struck by the differences between the estates here and those on Long Island. Generally speaking, the LI pleasure palaces are much bigger and fancier. I always supposed that had something to do with the fact that the LI houses tend to have been built more recently. And that in turn made me curious to know if there were older (from the mid-Victorian era or earlier) estates out on the island. I guess these last two postings answered that question for me. The South Shore estate era preceded that of the North Shore by about forty years. In contrast to my last two postings, quite a few of the South Shore estate owners preferred more modest Victorian era houses on two- to ten-acre plots. Of course, there were the Vanderbilts, Coes, Bournes, Knapps, Thornes, and Havemeyers, but the majority of the homes in our South Shore book are quite modest compared with the North Shore homes. George Campbell Taylor had always been a loner and wa, subsequently a recluse. His father was one of the greatest American businessmen. George seemed to be smothered by his father's wealth and repute. George never entered business, but rather traveled to Africa and later Europe. Decades later he returned to New York. George accumulated 1,500 acres and almost completely isolated himself. He had income from $13.6 million starting in 1882 (not $20mm) and accumulated another $9.2 million by the time of his death in 1907. It was widely thought that he had settled with Mrs. Bodley to avoid a will challenge. Glen Farm was established by H.A.C Taylor, not Moses Taylor Pyne. 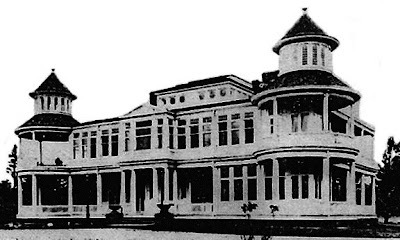 It was inherited by his son Moses Taylor (who died ~1928) and maintained by Mrs Moses Taylor -- Edith Bishop, later Mrs. G.J. Guthrie Nicholson -- until her death in the 1950s. Sometime therafter, it was all our mostly sold by their son Reginald Bishop Taylor. I'd love to see a site plan of how the grounds were laid out back then. I know where the horse barn, which still stands, is. I wonder where the mansion was in relation to that. I'd like to see that too Stu. I'd also like to know the history of the three smaller houses in the park. One has handhewn beams, but a 3 car garage.